Design and Manufacture of Pharmaceutical Tablets offers real world solutions and outcomes of formulation and processing challenges of pharmaceutical tablets. This book includes numerous practical examples related to actual formulations that have been validated and marketed and covers important data in the areas of stability, dissolution, bioavailibity and processing. It provides important background and theoretical information on design and manufacturing and includes a full section dedicated to design experimental methodology and statistics. 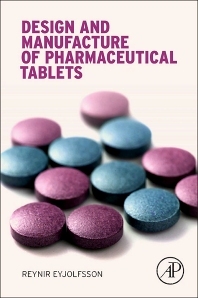 In addition, this book offers a a general discussion of excipients used in proper tablet design along with practical examples related to excipients. Drug development scientists in industry and academia, as well as students in the pharmaceutical sciences will greatly benefit from the practical knowledge and case examples provided throughout this book. Dr. Eyjolfsson entered pharmacy in 1959, having studied at the University of Iceland and then at the Pharmaceutical University of Denmark, Copenhagen 1961-1964 (MsPharm 1964). Dr. Eyjolfsson earned a Ph.D. in the chemistry of natural product from same university in 1968. He moved to Iceland in 1971 and has worked with drug formulation science at Pharmaco, Delta, Actavis until 2010. Dr. Eyjolfsson is an author of approximately 30 scientific papers in peer reviewed journals mainly on phytochemistry and pharmaceutics. He has designed many different dosage forms but mostly conventional tablets and slow release tablets.